You have to feel bad for Assassin’s Creed Rogue. Launched on the same day as the next-gen-favouring Assassin’s Creed Unity, it’s struggled for attention by only being released on the PS3 and 360. Having played through both games though, it’s clear Ubisoft Sofia’s plucky pirating underdog is the one that deserves the limelight. Why? Well, one has pirates, smooth swashbuckling, epic naval battles, a rich world to explore, a plot that seems to matter more in the series’ overall canon and the other has a glitch plagued Paris full of Yorkshire accents and borked controls. 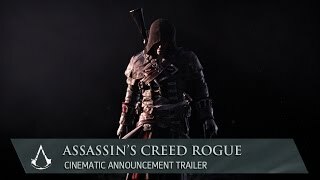 So, it won’t shock you to hear that if you enjoyed Edward Kenway’s adventures in Black Flag, you can expect more of the same brand of entertainment in Rogue. There are some changes though and their impact justifies a new game. For starters you now control a Templar. Shey Cormac is a former assassin now working for the other side, giving us a different point of view for the series, which works particularly well thanks to including characters from both Black Flag and ACIII. Don’t worry if you’re not fully up-to-date with the Americas AC series as the plot holds up well on its own, but if you’re a regular fan you’ll appreciate some of the surprisingly important AC universe implications that ensure the game’s place in the full canon rather than relegating it to a mere spin-off. The naval scenes are as addictive as ever and the addition of Templar technology to your ship is most welcome. Primitive machine gun-esque puckle guns are swapped in for additional damage and ramming abilities are greatly improved. You can finally buy a proper set of front cannons too. Icebergs can be shot to create destructive waves, the side winds are stronger than ever and you need to be wary of ships trying to board you for the first time. The upgrades and naval trading systems remain largely untouched (if it ain’t broke I suppose), but there’s no app support for trading this time which is a shame. On land, Shey handles magnificently when climbing buildings, trees and cliffs. Playing the game straight after Unity, it was alarming at how much better navigation is compared to the next-gen game. The same goes for the combat too. Countering and combos works as they should and you’re once again able to use enemies as human shields when under fire – which Arno is yet to work out. The series likes to play with historical feasibility somewhat, but the inclusion of a grenade launcher feels a bit ridiculous if I’m honest. Not that I’m against launching sleep grenades or berserk bombs at a crowd of guards. Shey is a better assassin (well, Templar) too than Unity’s dull lead. Dual hidden blade takedowns are slickly handled and the ability to whistle to distract guards to your position is included again, making its absence from Unity all the more frustrating. 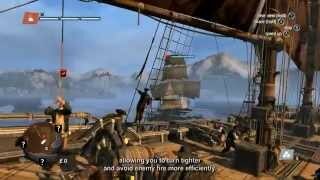 Mission structure doesn’t stray too far from the Creed template and you’ll be stabbing up Assassin leaders or boshing around in boats. That said, out of nowhere, a brief stage set in Lisbon absolutely rocked my face off and felt ‘bigger’ than anything else in the series. We’re talking Uncharted levels of jaw-dropping here. The side-missions on offer do try to change things up a little, which is made easier by Shey’s Templar leanings. So expect to try and sneak up on pigeons carrying Brotherhood messages and even protect unaware targets from multiple Assassins by using your eagle vision to pick the sneaky sods out of a crowd. You need to be alert whenever on land as Assassins hide in bushes or in a crowd, ready to pounce, with only a mild audio cue warning you of their potential presence. Rogue’s world is split into three separate maps, which I’ll admit is a little annoying, especially when trying to get a handle on the collectibles, but the overall size is simply astounding. So much time has been dedicated to making environments explorable paradises too, even generous land masses that you won’t need to visit during story levels. I lost count of the times I’d weigh anchor to grab a treasure chest from a beach only to be pulled into an expansive forest playground full of hidden totems, cave paintings, enemy camps and hunting activities. They feel much less like the ‘beach with a jungle corridor’ designs of Black Flag’s islands too. The locations themselves are richly varied too thanks to the game taking place in areas like the frozen areas of North America, New York and the warmer climes of the River Valley. Then there are the brief sojourns to Europe too. 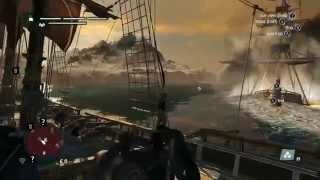 As a huge fan of the blissful visual vistas provided by the graphics in Black Flag on PS4, I was somewhat disheartened to hear Rogue was only heading to last-gen consoles. Well, slap my face for forgetting that the last-gen machines gave us some of the best looking games around as Rogue looks astonishing even compared to new-gen entries. The level of detail in the brickwork alone is marvellous and the vistas below any of the game’s many sync points are a constant reminder of how excellent just exploring this world can be, especially in the expansive mountain forest areas or while cooing at the northern lights from the mast of a frozen shipwreck in the arctic. With some solid foundations laid down by Black Flag, you might expect Rogue to simply reuse the same material and play things safe, especially as we imagine most development funds were thrown at Unity rather than the Sofia-based studio. Keen to make the best game they can though, the studio has made a compelling sequel that’s a fine send off for Assassin’s Creed’s Americas series. Ubisoft Sofia has ensured the last-gen hardware stands proud against the new generation with one of the most impressive-looking games of the year in the small details and landscape design. The sea shanties are utterly enchanting again too. Handles magnificently, even more so when compared to Unity’s clumsy escapades. Playing as a Templar changes mission elements just enough, nailing a balance of familiar and fresh. The main story is tad shorter than Black Flag, but the beautifully varied world will ensure there’s plenty of extra hours to be spent exploring for collectibles and loose ends. Current day/night/weather cycle is ignored in cutscenes. Otherwise, not a technical hiccup in sight. Far from being an unloved spin-off, Assassin’s Creed Rogue has turned out to be one of the gaming highlights of the year. Forget Unity’s troubles, this is the ultimate Assassin’s experience of the year and should be snapped up immediately.